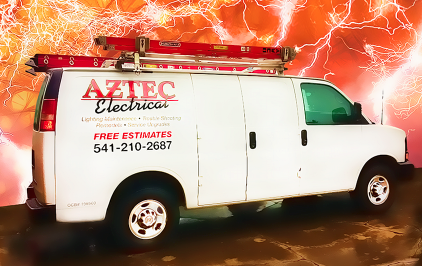 Aztec Electrical provides professional electricians throughout Rogue Valley to homes and businesses. An important service is lighting & fixture maintenance. This includes retrofits, along with installing interior and exterior lighting services. You can receive a safety inspection and ideas on reducing your power bills with the Energy Trust of Oregon. We are certified with that Trust to show you how to receive cash rebates. Home and businesses have used our services to install and service low voltage systems. Typically we provide diagnosis, installation, and repair of low voltage wiring including 120V home lighting, security cameras, and alarms. We can design a low voltage system that might include computer systems, or protection systems.